Outdoor Performances at John Hinkel Park in Berkeley. Sometimes the seating at John Hinkel Park can be a little bumpy or twiggy. We recommend bringing a blanket, pillow or old beach chair to make your experience more pleasurable. We cook homemade vegetable stew and sausages every day - so if you forget to pack a picnic - we've got it covered. Commerce is the true engine of war. All other reasons are mere window dressing to the most fundamental question: Is there money to be made? When asked what he wanted his audiences to walk away from in a production of Mother Courage and her Children, Brecht stated, "That war is a continuation of business by other means, making human virtues fatal even to those who exercise them. That no sacrifice is too great for the struggle against war." 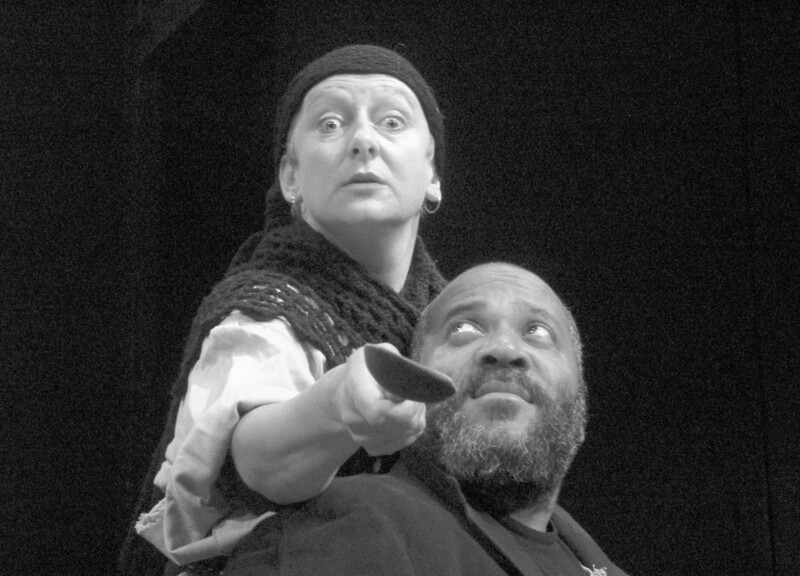 Generally recognized as one of Bertolt Brecht's greatest, Mother Courage and her Children joins the list of plays Shotgun has produced in the last 2 years that poke and prod the causes, justifications and results of war. Live music performed from an original score supports the comic irony of this powerful epic. Using the historic wars between Sweden and Poland and the subsequent 30 Year War as his inspiration, Brecht wrote Mother Courage and her Children in 1938 as a warning to Sweden not to get involved in the crisis that was leading to the 2nd World War. Circumstances prevented Brecht from immediately producing the play and he was very disappointed with the aesthetically pleasing but poorly directed first production in 1941 that painted Anna Fierling (Mother Courage) as a poor victim in a big bad world. Frustrated by this, Brecht made some changes to the text, which more clearly illustrates a Mother Courage who chooses her own destiny, but learns nothing from her mistakes. Brecht was not interested in writing plays where the characters have the epiphanies - he wanted his audience to have them. His own production opened on January 11th, 1949 and led to the formation of one the greatest theatre companies of the modern era - The Berliner Ensemble. Of the three other "War Plays" that Shotgun has produced in the last 2 years, each playwright (Shakespeare, Giraudoux, & Euripides) used the idea of war to analyze themes of honor, morality, family, gender politics and destiny. 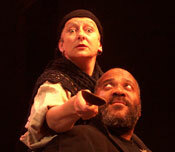 In Mother Courage and her Children, Brecht trains a strong focus on the causes and results of war. He works through the eyes of a shrewd businessman (or in this case woman). Recent events in our global economy have made us conscious that a tremendous amount of violence can be done in business transactions where no trigger need be pulled. Audiences will be provoked to look at the "business" they conduct in their lives and question whether they are participating in trade that helps to facilitate violence or injustice. Original live music supports Mother Courage in a voyage that crosses from the humorous to the tragic and back again. corner of Arlington and Southhampton Avenue.  Take the 80 N toward Berkeley/Sacramento.  Take the Buchanan exit towards Albany. Turn right onto Buchanan after exiting.  Go .5 mile on Buchanan, fade right (Buchanan then becomes Marin) and drive 1.6 miles east on Marin to the roundabout at the Marin Circle.  Take a right on Arlington Ave and go 1/3 of a mile to Southampton.  Turn right onto Southampton  drive one block and look for parking to the left or right.